It’s officially the Summer time ladies! Time for backyard BBQs, beach days and endless sunshine. I absolutely love this time of year because its all about showing a little skin and taking in the warm sun rays. I stepped a bit out of my comfort zone with this outfit because traditionally, I have stayed away from rompers. I have never been able to find one that really flattered my body type. Most of them were either too short, too small or just plain ill fitting. I pretty much got to the point where I gave up on them altogether. I decided to give them one more try with this 70’s inspired romper from ASOS and I’m so glad I did. You can really tell when a company makes a garment with plus size women in mind. 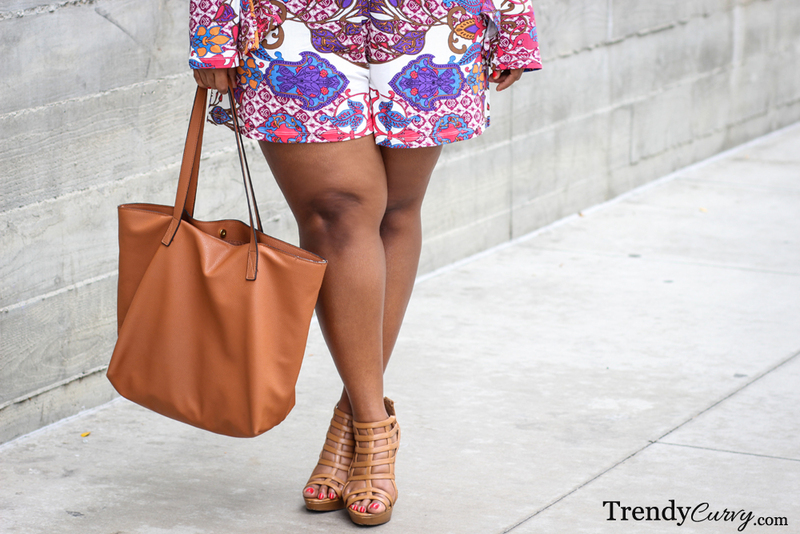 From the longer length shorts to the elastic waistband to the fabric choice, it has restored my faith that rompers really can work for curvy frames. I encourage you all to step out of your comfort zones this season and try something that you would never normally wear. You may surprise yourself like I did! You look great! I went to Asos to purchase and they should have had you model it because you make it WERK!!! This look is a work of Art!